This game created the template for watching soccer while working. ESPN picked up the rights to this tournament and I fell in love with Croatia, saw Gazza’s wonder goal against Scotland, and the Czech Republic’s heartbreak in the Final against Germany. 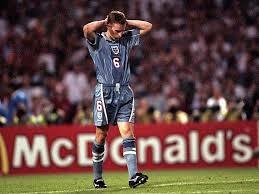 In the previous round, England played Germany in a rematch of the 1990 World Cup Semi. I was working as a summer intern at the FBI and snuck up to a conference room to watch the second half and penalties. England were so close but after 11 perfect spot kicks, Southgate’s miss condemned the Three Lions to defeat. As my love for the Red Devils continued to grow, the Treble season reached its dramatic conclusion in Barcelona. With no Keane or Scholes, United was up against it and when Basler scored in the opening minutes, I didn’t believe. Negative by nature I just waited for Bayern to seal the game and accept defeat. 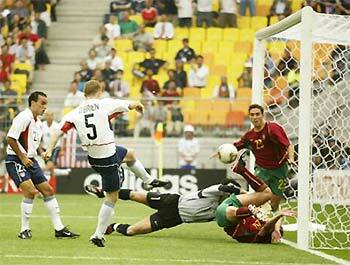 But when Sheringham poked home from close range I screamed with excitement. 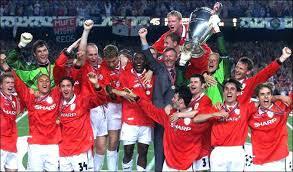 And when Solskjaer put the ball in the Germans net, I ran around the house in sheer joy. In the days leading up to the game, I had a dream that the US crushed Portugal like 6-0 but I had missed it by sleeping in. Due to the time difference, the game kicked off at 4am ET. On the morning of the game, I drove frantically to a friend’s house who was hosting people. After the early US blitz I thought maybe I had had some sort of premonition but alas, Portugal fought back and made for a nervous last couple of minutes. That tournament was amazing and I got up at all hours to watch the matches. In the late 90s and early 2000s I start following FC Barcelona and watched a dramatic 2006 Champions League Final against Arsenal. In the years following, that magic team was broken up and rebuilt and taken over by Pep Guardiola who drove the Blaugrana to an unprecedented, at the time, Treble. Real Madrid hunted Barca down in the league and set up a crucial meeting at the Bernabeu, and when Los Merengues scored first, a sick feeling came over me. And then magic happened with Henry and Messi tearing apart the hosts, each scoring twice, and also getting goals from Puyol and Piqué. It was breathtaking and set the stage for Iniesta’s moment of magic at Stamford Bridge and an amazing finish to the season. The dramatic end to the 1988-89 season was before my time, so when United came back from 0-1 against Spurs in the final league game of 1999 to clinch the title, I didn’t think it could get much better than that. I was wrong. A bunch of fellow fans gathered at Buffalo Wild Wings for Fox’s Survival Sunday, with all ten games on an array of channels. With fans from several different teams present, cheers and groans were constant depending on the action. Eventually we started calling out the TV numbers to keep track of the events. United secured victory at Sunderland and with City down 1-2 against QPR, another league title looked secure. But the fickle finger of fate intervened and Dzeko equalized, setting up Aguero’s moment of glory. Stunned I drank several shots as I watched the celebrations at Etihad. Gutted by the result, it was still one of the greatest soccer community events I have ever experienced. Let me know what games impacted your soccer support in the comments below.